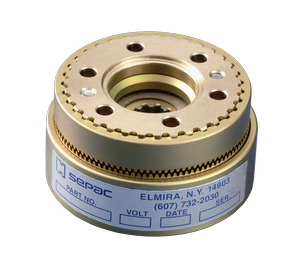 This SEPAC stationary field tooth clutch is designed to operate both dry and in oil. There are no bearings in the model which makes it suitable for higher speed applications. Many options are available. When current is applied to the coil in the magnet body, a magnetic field is created which attracts the armature (sliding on the adapter) toward the rotor. As the teeth engage, torque is transmitted. Springs between the armature and adapter assist in disengagement. The magnet body is mounted to a wall or plate of the machine.